Atop the fifteen hand-written signatures you’ll see when you open Yeske Buie’s holiday card this year, you’ll see the names of two charities that Yeske Buie has made a donation to in the name of our Clients: the American Red Cross and the Foundation for Financial Planning’s Pro Bono for Cancer Campaign. To bring to life the meaning of our donation to the Pro Bono for Cancer Campaign, we’d like to share a story about our remarkable experience that inspired this year’s donation. Many parents of kids with disabilities will tell you that supporting and caring for them is one of the hardest yet most rewarding things they’ve had the privilege of doing. These families have many facets of their lives to manage, and money typically is the most substantial factor weighing them down. Fortunately for these families, recent changes to ABLE accounts will better assist them financially. Continue reading to learn more about these accounts and the strategies that can be used to maximize their benefits. Open enrollment for 2019 Medicare plans ends one week from today on Friday, December 7th. Missing this deadline can result in a costly penalty or a gap in coverage, so it’s important that those desiring coverage pick a plan before the enrollment window closes. Being eligible for the program, however, doesn’t mean that it’s easy to decipher the best course of action amongst the array of available options. We’ve put together a brief guide about the various Medicare components and some of Yeske Buie’s suggestions for making your journey through the enrollment process as seamless as possible. Given today’s cyber-climate, it shouldn’t come as a surprise that Cyber Monday is an identity thief’s favorite holiday. It’s not a coincidence, then, that the cyber-world is “celebrating” Computer Security Day today, November 30th. Computer Security Day has been around since computers started to become commonplace in the late 1980s, although security practices have evolved significantly as technology has become more sophisticated. In celebration of Computer Security Day, we share a collection of pieces we’ve written on the topic of cybersecurity for you to consider as you work to keep your personal information secure. Three years ago, Elissa and Dave became involved with Cappella SF, an exceptional a cappella group founded and directed by Ragnar Bohlin, Emmy award winning director of the San Francisco Symphony Chorus. We were dazzled by the group’s first Christmas album, Light of Gold, that released in 2015 and this year, we are excited to share that Capella SF has released a new album entitled, Timeless: Ten Centuries of Music. 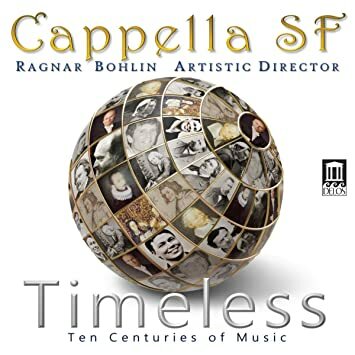 Just like the first, this new CD is a reminder of the joy that Cappella SF’s music inspires, and we hope that it fills your ears and soul the same way it has for us. To anyone who is interested, we would like to offer you a copy of this CD; simply email Mila@YeBu.com and she will promptly ship one to your home. Here is a link to a sample of Timeless that will give you a taste of what this CD has in store for you. Happy Holidays!